Todays wedding planning post is about our save the dates! I knew I wanted one of our football pictures to be the focus of our save the date so after having zero luck on Shutterfly I decided to try Minted.com which worked out perfectly. Minted had a setting where I was able to design my save the date the way I wanted it. I think they turned out really nicely! I chose another one of my favorite pictures from our engagement session for the back and put our wedding website on there as well so people will have that information. When I went to the post office to buy stamps I thought these blue one were perfect since they match our colors and look beachy. 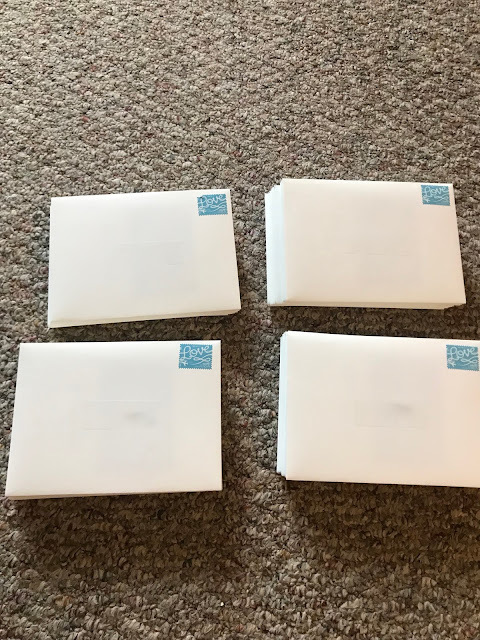 I had to blur out all the addresses for privacy reason but here are our first wave of save the dates ready to be mailed! I also purchased a self inking stamp from Shutterfly to stamp our address on the back of every envelope. It was very helpful and saved time when putting them all together! I'm obsessed with our save the dates and can't wait to start hearing people have received them!